How Long Should Your New Tires Last? Tires do have an expiration date. We feel tires should be inspected regularly and replaced every six or seven years regardless of how much tread they have left. How can you tell how old your tires are? There’s a code on the sidewall. Wear is easy to determine: Tire makers and safety advocates say a tire is worn out when its tread depth reaches 2/32 of an inch. If your car is registered in Pennsylvania it is measured at each state inspection. So, how can you tell how long to expect a set of new tires to last? The average American drives between 14,000 and 15,000 miles a year, according to data from the Federal Highway Administration. When you are kind to your tires—meaning you aren’t peeling out from or screeching to brake at red lights, most new tires should last an average of 60,000 miles. There was a study on thousands of scrapped tires and most were three to four years old. There was no way of telling how many miles were on those tires, but you can estimate four years by 15,000 miles annually and guess the durability of tires. If you want to determine how soon you might have to replace the tires on your car, calculate how many miles you drive each year. Divide the number of miles on the odometer by how many years you’ve owned the car. Then you can compare that with the warranty on your tires and figure out how many miles/years to expect. If you use both summer and winter tires your will also have to take that into consideration respectively. However keep in mind what we’ve said regarding tire age. From the ‘ounce of prevention’ perspective some basics tire maintenance tips can keep you and your passengers safe. 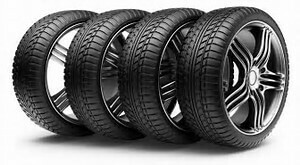 Some tires have tread-wear indicators that are little bars in the tread that show the tire is worn down to replacement level and will start making noise to alert you they need attention. Our favorite hack is to put a penny in the tread with Abraham Lincoln’s head inside the tread if you can see the top of Abe’s head, you definitely need new tires! The key to maintaining even wear is to check your tire pressure monthly to the vehicles recommended PSI, this can be found in the car’s doorjamb or in your owner’s manual. We advise keeping a tire-pressure gauge in your car. Some gas stations have digital readouts as part of their air pumps (these are not always accurate) you should check the pressure when the tires are cold when they have not been driven for several hours. For example checking them after the car has been parked overnight. You can always stop in at C.S. Cantlin Automotive and we are happy to check the pressure for you, just keep in mind the tires may not be cool at that time. Tires also need to be balanced. We use a balance machine, which spins the wheel to see where high and low spots are and detects any imbalance. We will then add weights, which are hammered onto the wheel, to balance them. Proper alignment is also key to ensure proper wear, as well as rotating your tires at regular intervals. Front-wheel-drive vehicles will wear front tires more quickly and can be swapped with the rear ones. The inverse is true for rear-wheel-drive cars. All-wheel-drive models also need rotation. You must be aware if your car has staggered tires meaning your front tires are a different from the rear tires and can only be rotated left and right. Your owner’s manuals contain a recommended pattern for rotating tires to ensure even wear. We recommend your tires be rotated every 5000 to 8000 miles.